Tune in to this Pisces Full Moon by spending time alone, as you submerge yourself in deep emotions, explore your spirituality and mystical inclinations and give yourself permission to swim like a mermaid in a sea of color, beauty and divine inspiration. Have "faith" - a keyword for Piscean energies - it's time now to trust and allow your intuition to guide you into all those hidden places you're just longing to explore. 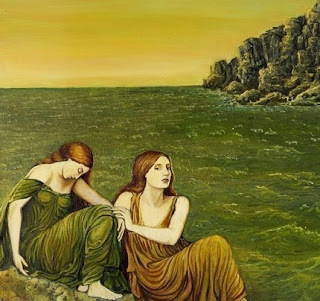 In honour of this Pisces Full Moon, I would like to share with you the mythical, figurative acrylic paintings of Piscean artist, Emily Balivet who shares with us her own Piscean influences. 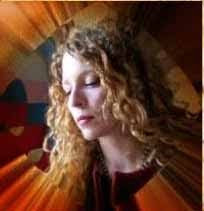 We Pisces have an instinctive awareness of higher levels of consciousness. The mind is a playground of daydreams and fantasy where we seek to stretch and broaden our reality maps. Some may meet this need through spiritual devotions, an interest in psychology, or perhaps the study of the paranormal. Others may find themselves using drugs or alcohol. 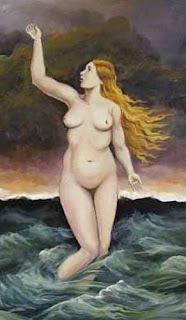 In any case, Pisces enjoy playing with the mind and achieving altered states of consciousness. I enjoy my time alone painting and sometimes find it difficult to re-enter the "real" world. You see, a Pisces understands that the "self" is simply a mask we put on, just one point in a vast ocean of infinite possibilities. Because life often presents us with the unexpected, we find it necessary to have a variety of masks to use as the situation calls for it. Sometimes I just have a hard time finding the right mask for the day. It is this elusive, multi-faceted quality of Pisces that makes it difficult to pin us down. Try catching a fish with your bare hands and that's about what it takes to "know" a Pisces. We are ever-morphing shape shifters. Where my art is concerned, this means that I may have several paintings going at once with wildly varying themes. All of my paintings reflect back an aspect of myself, but none are "me". By the time I'm finished with a painting, I've already moved on. This makes it a rare occasion that I create something I'm actually attached to. Of all the Piscean attributes, the one that stuns me the most is the gift of intuition. The core of my art may simply be imaginative play with color and the suggestion of shape, but as the process unfolds and as forms and details are worked in, I'll step back and realize a deep relevance has appeared on the canvas. 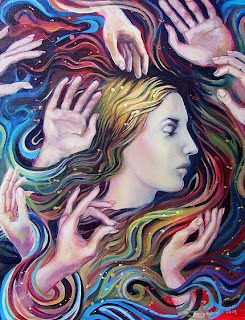 It is as though each of my paintings is a personal divination, a tarot card of sorts, and often a thrilling psychic experience. I have a distinct feeling that "I" am not painting - that something larger is working through me. Call it the "Muse" or "Totally Other" or whatever you will, I am a devotee to the end!